Asynchronous programming with Node.JS is easy after getting used to it but the single threaded model on how Node.JS works internally hides some critical issues. This post explains what everybody should understand on how the Node.JS event loop works and what kind of issues it can create, especially on high transactional volume applications. What The Event Loop Is? When this program is executed the setTimeout function is called immediately. It will register a timer into the event loop which will fire after one second. After the setTimeout call the program execution freezes: the node.js event loop will patiently wait until one second has elapsed and it then executes the printHello() function, which will print “Hello World!”. After this the event loop notices that there’s nothing else to be done (no events to be scheduled and no I/O operations underway) and it exists the program. We can draw this sequence like this where time flows from left to right: The red boxes are user programmable functions. In between there’s the one second delay where the event loop sits waiting and until it eventually executes the printHello function. the Redis client constructs a TCP message which asks the Redis server for the requested value. A TCP packet containing the request is sent to the Redis server. At this point the user program code execution yields and the Node.JS event loop will place a reminder that it needs to wait for the network packet where the Redis server response is. The Redis client does some internal processing and then calls our callback, the printResponse() function. We can draw this sequence on a bit higher level like this: the red boxes are again user code and then the green box is a pending network operation. As the time flows from left to right the image represents the delay where the Node.JS process needs to wait for the database to respond over network. Now when we have a bit of theory behind us lets discuss a bit more practical example: A simple Node.JS server receiving HTTP requests, doing a simple call to redis and then return the answer from redis to the http client. Let’s look again an image displaying this sequence. 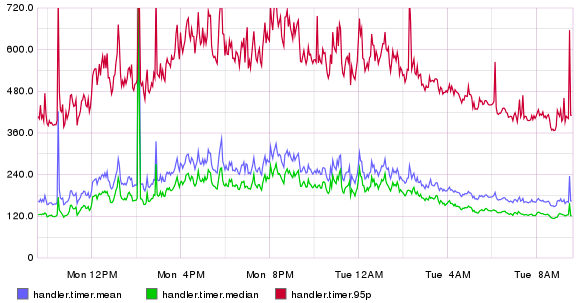 The white boxes represent incoming HTTP request from a client and the response back to that client. Now you can see that the 3rd request can’t start its handler() function right away because the handler() on the 2nd request was still executing. 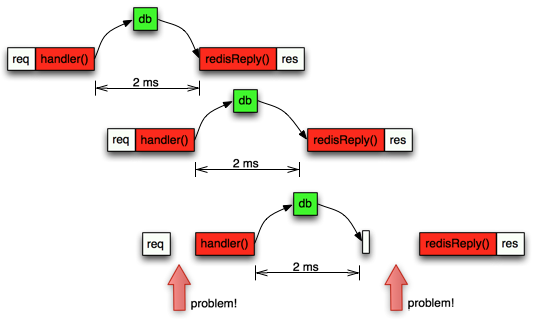 Later the redis reponse from the 3rd arrived after 2ms to the event loop, but the event loop was still busy executing the redisReply() function from the 2nd request. All this means that the total time from start to finish on the 3rd request will be slower and the overall performance of the server starts to degrade. This shows the scary truth much better: for 1% of our users the request latency is 50 milliseconds, 16 times longer than average! If we draw this into graph we can see why this is also called a long tail: On the X-axis we have the latency and on the Y axis we have how many requests were completed in that particular time. So the more requests per second our server servers, the more probability that a new request arrives before the previous is completed rises and thus the probability that the request is blocked due to other requests increases. In practice, with node.js when the server CPU usage grows over 60% then the 95% and 99% latencies start to increase quickly and thus we are forced to run the servers way below their maximum capacity if we want to keep our SLAs under control. It’s also worth noting that if you try to fetch the entire history instead of just two weeks, you will end up with a system which performs quite well at the start but will gradually getting slower and slower. As we can see the time between start and end measurements were affected due to some other processing happening at the same time. In practice when you are affected by a busy event loop all your measurements like this will show highly elevated latencies and you can’t trust them to measure the actual external databases. On an idle process the profileEventLoop function should print times like 200-203 milliseconds. If the delays start to get over 20% longer than what the setTimeout was set then you know that the event loop starts to get too full. Here we increment a counter handler.requests each time we get a new incoming request. 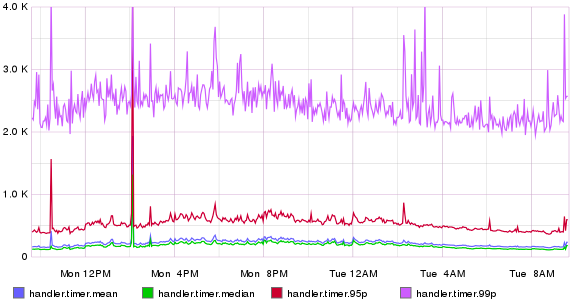 This can be then used to see how many requests per second the server is doing during a day. In addition we measure how long the total request took to process. Here’s an example what the results might look when the increasing load starts to slow the system and the latency starts to spike up. The blue (mean) and green (median) latencies are pretty tolerable, but the 95% starts to increase a lot, thus 5% of our users get a lot slower responses. Node.JS is not an optimal platform to do complex request processing where different requests might contain different amount of data, especially if we want to guarantee some kind of Service Level Agreement (SLA) that the service must be fast enough. A lot of care must be taken so that a single asynchronous callback can’t do processing for too long and it might be viable to explore other languages which are not completely single threaded. How about starting a bunch of nodejs processes (on different ports obviously) and using a roundrobin based load balancer to dispatch requests? Wouldn’t that solve this problem? Thanks! That is the standard way to scale out node.js programs. It will of course help, but you will run into the same problem just a bit later when the traffic has increased enough and the CPU load is too high. Thanks for the interesting and enlightening article. It seems that Node.js is only suitable for microservices where there is little to no processing involved. For instance, calling different APIs and aggregating the responses.